The good news about gum disease is that, for most patients who don’t have it yet, it’s highly preventable. For those who do, it’s also highly treatable, and for some patients in Encinitas/San Diego, it might even be reversible. It depends on how severe the condition has become, though in most cases, your periodontist can help you restore your good periodontal health by effectively addressing it as soon as possible. The most effective way to protect your smile from gum disease is to prevent it, which requires constantly good hygiene at home and regular preventive care from your dentist. The disease begins when oral bacteria invade your periodontal tissues and settle underneath them. At that point, it’s too late to brush and floss the bacteria away. The longer they remain, the greater the chance that they’ll lead to gingivitis – the first stage of gum disease. Prevention fails when gingivitis develops as a result of excessive bacteria buildup underneath your gums. However, if your periodontist detects and treats gingivitis in its earliest stages, you may have a chance of reversing your condition and avoiding more serious gum disease. Treatment involves carefully cleaning the harmful bacteria from underneath your gums, where they’ve settled on your teeth roots. The process, known as scaling and root planing, will allow the infection to subside and your periodontal tissues to heal. In more severe cases gum disease, the condition can become so invasive that it can no longer be reversed. Fortunately, ongoing treatment and maintenance with your periodontal specialist can help you keep gum disease under control, preventing your periodontal tissues from becoming overly inflamed or eroding further. Because the disease will remain, you may require routine periodontal maintenance for the rest of your life. 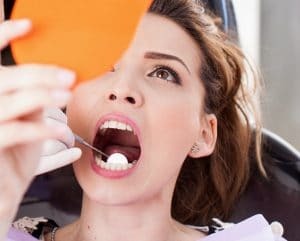 If it’s too late to prevent gum disease, then whether or not you can reverse it or will have to continue managing it will depend on how severe it is by the time you address it. For more information, schedule a consultation with Dr. Kania by calling her periodontal office in Encinitas/San Diego, CA, at (760) 642-0711.